BERKELEY, CA  A bio-friendly nano-sized light source capable of emitting coherent light across the visible spectrum, has been invented by a team of researchers with the U.S. Department of Energy’s Lawrence Berkeley National Laboratory, and the University of California at Berkeley. Among the many potential applications of this nano-sized light source, once the technology is refined, are single cell endoscopy and other forms of subwavelength bio-imaging, integrated circuitry for nanophotonic technology, and new advanced methods of cyber cryptography. 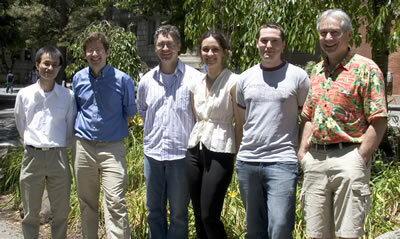 The team of researchers who created the nanowire light source included, from the left, Peidong Yang, Jan Liphardt, Peter Pauzauskie, Aleksandra Radenovic, Robert Onorato and Richard Saykally. “Working with individual nanowires, we’ve developed the first electrode-free, continuously tunable coherent visible light source that’s compatible with physiological environments,” said chemist Peidong Yang, one of the principal investigators behind this project, and a leading nanoscience authority who holds joint appointments with Berkeley Lab’s Molecular Foundry and Materials Sciences Division, and the UC Berkeley Chemistry Department. Yang and Liphardt were among the co-authors of a paper that is featured on the cover of the June 28, 2007 edition of the journal Nature. The paper is entitled: “Tunable Nanowire Nonlinear Optical Probe.” Other authors of the paper were Yuri Nakayama, Peter Pauzauskie, Aleksandra Radenovic, Robert Onorato and Richard Saykally. In this paper, the researchers describe a technique in which nanowires of potassium niobate were synthesized in a special hot water solution and separated using ultrasound. The wires were highly uniform in size, several microns long, but only about 50 nanometers in diameter. A beam from an infrared laser was used to create an optical trap that allowed individual nanowires to be grabbed and manipulated. Because of potassium niobate’s unique optical properties, this same beam of infrared laser light also served as an optical pump, causing the nanowires to emit visible light whose color could be selected. In a demonstration of the technique’s potential, these nanowire light sources were used to generate fluorescence from specially treated beads. In a demonstration of the nanowire light source’s fluorescence mode, a nanowire in the grip of an infrared beam was touched to a fluorescent bead causing the bead to fluorescence orange at the contact point. Figure a shows the experimental set up with the pair of beads on the right as control; b is a bright-field optical image of the beads, with the nanowire in contact with the leftmost bead; c is a color CCD fluorescence image showing green light emission from the nanowire and the orange emission from the bead; d is a control image of the same beads with infrared radiation but no trapped nanowire; and e is digital subtraction of d from c.
Bio-imaging may be the field in which this nanowire light source technology has its biggest impact. Optical or visible light microscopy remains at the forefront of biological research because it allows scientists to study living cells and tissues. 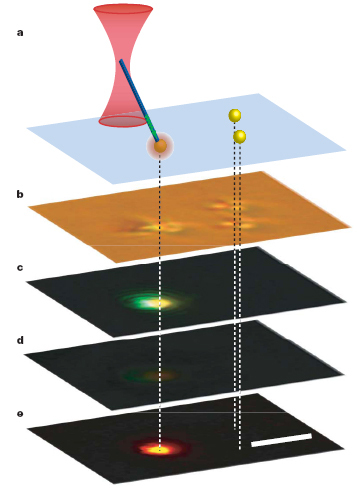 However, whereas the resolution of optical microscopy is limited by diffraction, through subwavelength techniques it becomes possible to visualize features smaller than visible light wavelengths. For biology, this brings normally invisible subcellular structures into view. 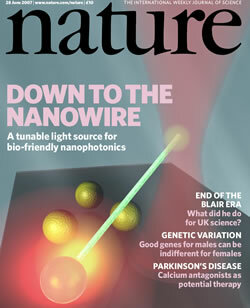 The bio-friendly, tunable and coherent nanowire light source developed by Berkeley researchers was featured on the cover the journal Nature. Yang and Liphardt caution that the nanowire light source technology is at a very early stage of development. Liphardt compares it to where atomic force microscopy was some 10 years ago. He also says that this technology is not intended to replace existing microscopy technologies, but will enable researchers to do things that cannot be done with current technology. This work was supported by the Office of Science, Basic Energy Sciences, Division of Materials Science of the U.S. Department of Energy, and by the Dreyfus Foundation, the University of California, Berkeley, the Experimental Physical Chemistry Program of the National Science Foundation, and NASA.